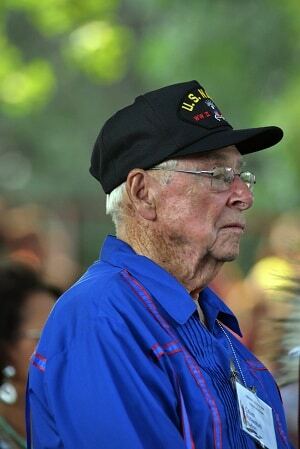 Born June 16, 1927, John V. Anderson grew up in Choctaw, Oklahoma during the Great Depression. At the age of 17, his father signed the papers that allowed John to enlist in the Navy. He served as a seaman on the USS Siboney from June 1945 until August 1946. Upon ending his tour of duty with the Navy, John pursued a job at Liberty National Bank & Trust because his childhood friend, the late Pat McKinney, encouraged him to apply. He was hired under an on-the-job training program for GI’s as a messenger. He steadily moved up through the ranks working as a bookkeeper, on the teller line, and then to auditing where he worked for 16 years. In 1969, John was named an Assistant Vice President and by the time he left Liberty National Bank in 1973 he had been named a Senior Vice President in charge of Liberty Operations with oversight of security, transit and proof, bookkeeping and tellers, systems and procedures, collections, purchasing, payment services, and as liaison for the bank. Mr. Anderson purchased Farmers & Merchants Bank in Crescent at the age of 45 in September of 1972. However, he did not take over as president and CEO of the bank until 1980 because he did not want the bank to incur a salary for him. Rather he named his friend and mentor Pat McKinney to the post while John continued to work five years from 1973 to 1978, as president of First National Bank of El Reno and then two years from 1978 to 1980 as Senior Vice President of United Bank and President of United Bank Advisory Services located in the Oklahoma City Stockyards. He assumed the President and CEO position with Farmers & Merchants Bank in January of 1980. Through the years, F&M Bank has grown from $5 million in assets to $410 million in assets and 9 locations. Today, the bank employs more than 100 full-time employees across Crescent, Edmond, Guthrie, Kingfisher, Piedmont, and Yukon. Mr. Anderson still actively comes into the Crescent location every day, serving as Chairman, Emeritus and Director for F & M Bancshares, Oklahoma City. His sons Terry, Barry and John Tom work with him running the various branches of the banks and his daughter Patti Rains also works in banking operations after retiring from a long career in education. Mr. Anderson is active in the Crescent community as a deacon at First Baptist Church and has served as president and in other capacities with the Crescent Chamber of Commerce, Crescent Lions Club, and Crescent Public Schools Foundation. He also served as president of the Central Oklahoma Chapter of the Bank Administration Institute; and as a director and officer of the Oklahoma Bankers Association. He has been married to his wife Jo, for 67 years. John is also a proud grandfather and great grandfather. According to son, John Tom Anderson, his father routinely tells others how blessed he has been with opportunities he could have never dreamed would happen in his life. Today, we honor John for his 70 years in banking recognizing the contributions he has made to the industry, and his service on the Board of Citizen Potawatomi owned – First National Bank & Trust Co. since 2010.